The WAND Program offers entrepreneur strategies to emerging business owners, who need “hands on” technical support and tools to position their business for success and sustainability. Our workforce development programs provide 21st Century job search skills to those with barriers to employment, including, individuals seeking to navigate the job market, identify transferable skills and re-brand themselves for new and current employment opportunities. Next Session begins: March 26th – June 4th , every Tuesday from 5:45 to 8:30 p.m. The Mind Your Business Boot Camp Series focuses on 21st Century networking, marketing and operation skills to take a solid business idea to the next level. Participants are taught how to market a business or service through the use of internet and cloud-based applications. Designed for clients that need maximum flexibility and immediate income return with little to no capital investment. Graduation following program end entrails clients presenting in front of Subject Matter Experts (SME’s). The course facilitator is Pedro Moore, an award winning serial entrepreneur and venture capitalist. Scholarships are available based on income, click here to apply. 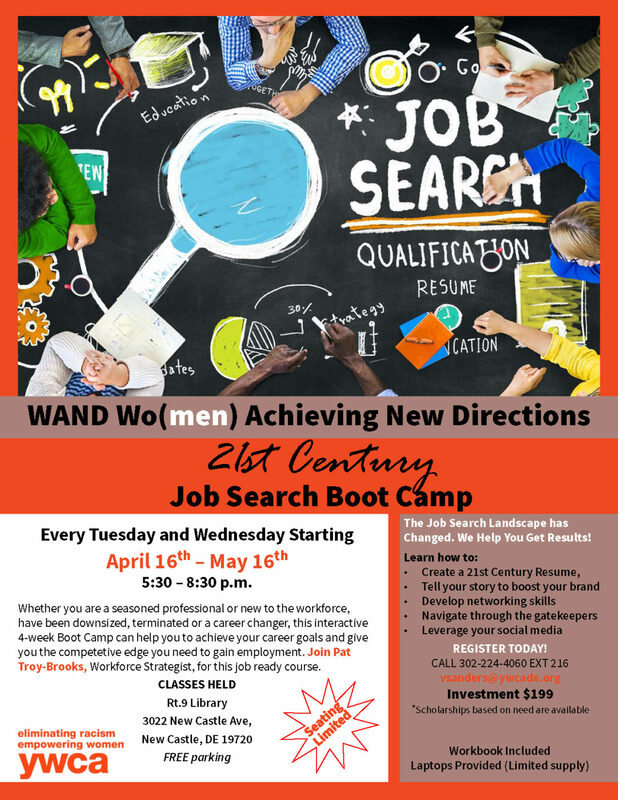 The 21st Century Job Search Boot Camp is a comprehensive program that offers the latest techniques for navigating the maze of the 21st Century job market. Clients create an individual action plan with short and long term SMART goals. Develop a 21st Century resume, identify transferable skills, learn how to create a brand for themselves, and communicate how to re-tell their story for new employment opportunities. Graduation following program end entails clients presenting their journey in front of an audience of attendees. The course is facilitated by Pat Troy-Brooks who is a work force development strategist expert and serial entrepreneur. Delaware SCORE offers numerous workshops and seminars throughout the year on a variety of different topics of interest to new and existing business owners. Click here to learn more about SCORE DE . 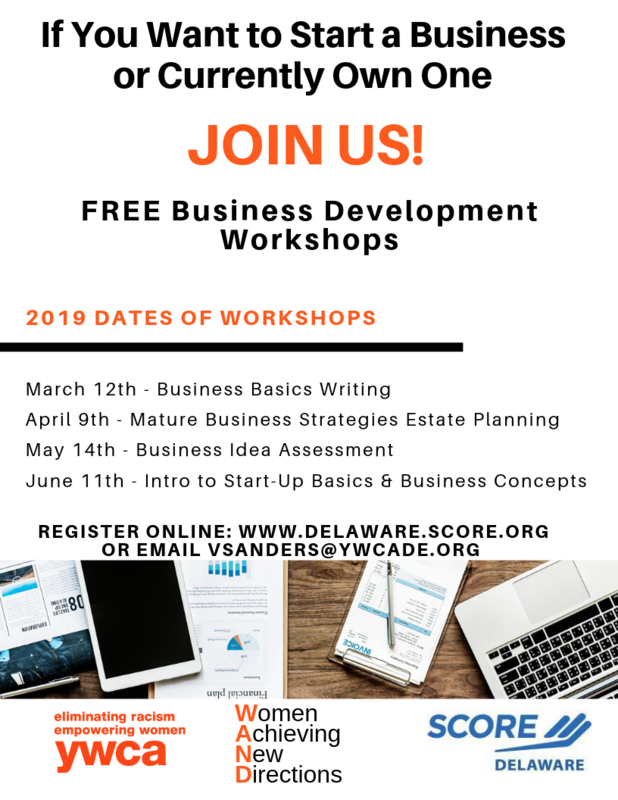 The WAND program is thrilled to be a yearlong partner with SCORE Delaware in offering FREE Business Development workshops at the Rt.9 Library every 2nd Tuesday of the month from 5:45 to 8:00 p.m. , the classes vary on what the topic is every month. Check out the flyer below to what classes are going on. The WorkAbility Boot Camp Series is a career readiness skills for individuals who are new to the workforce or have experienced significant instability in their work life as well as people with substantial barriers to gaining employment. This program offers fundamental components and soft skills needed to develop a work mindset. Graduation following program end entails clients presenting their journey in front of an audience of attendees. The Wo(men) Achieving New Directions Program offers complimentary business development, advisory , technical and one- on-one counseling for aspiring business owners or those who are already in business. Take advantage of your FREE business consultation today, complete a brief form (see link below). A team member of the WAND program will reach out to you shortly after you complete the form. Labs are 1,6,8 hour intense workshops designed to provide hands on technical assistance helping individuals to design and deliver marketing, social media, financial tools to promote efficiency or effectiveness for their business or career. Such as: Google Business Suite, Book Keeping, LinkedIn, Accounting Basics, Facebook Analytics. 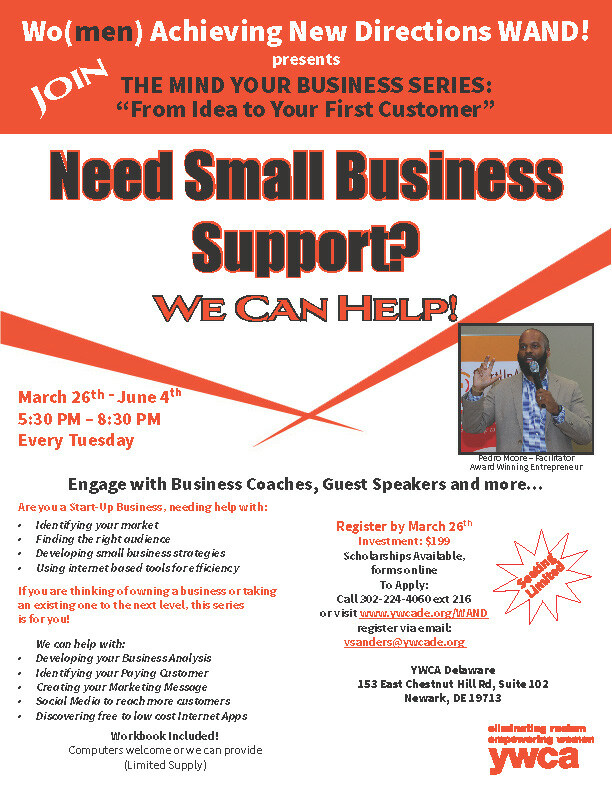 Time: 5:45 to 8:30 p.m.
to move you to the next level in your small business.